One of the great things about working in IT is that you can often win an argument simply by being right. Not because of who you are or because you are more eloquent than others, but because the facts support your position. Almost every IT person I have ever met respects facts. I wanted to install Oracle JDevelper 12.1.3 – a version that I had been eagerly awaiting. Since my primary machine is a MacBook, I wanted to install it on OS X 10.9.3. Not too sure what I changed on my laptop, possibly just installation of another product or perhaps Microsoft or similar updates, but when I went to edit a BI Publisher RTF template I got the following error message on clicking ANY button in the BI Publisher plugin for Microsoft Word. I’ve been working on a lot of good schtuff lately on the area of capacity planning. And I’ve greatly improved my time to generate workload characterization visualization and analysis using my AWR scripts which I enhanced to fit on the analytics tool that I’ve been using.. and that is Tableau. So I’ve got a couple of performance and capacity planning use case scenarios which I will blog in parts in the next few days or weeks. But before that I need to familiarize you on how I mine this valuable AWR performance data. Lately I’ve been busy on projects and research so I’m putting more and more stuff on my wiki/braindump… and really I need to catch up on blogging. I have a longer draft post about SQLTXPLAIN.. but I haven’t finished it yet so I’ll just go with the quick post for now. 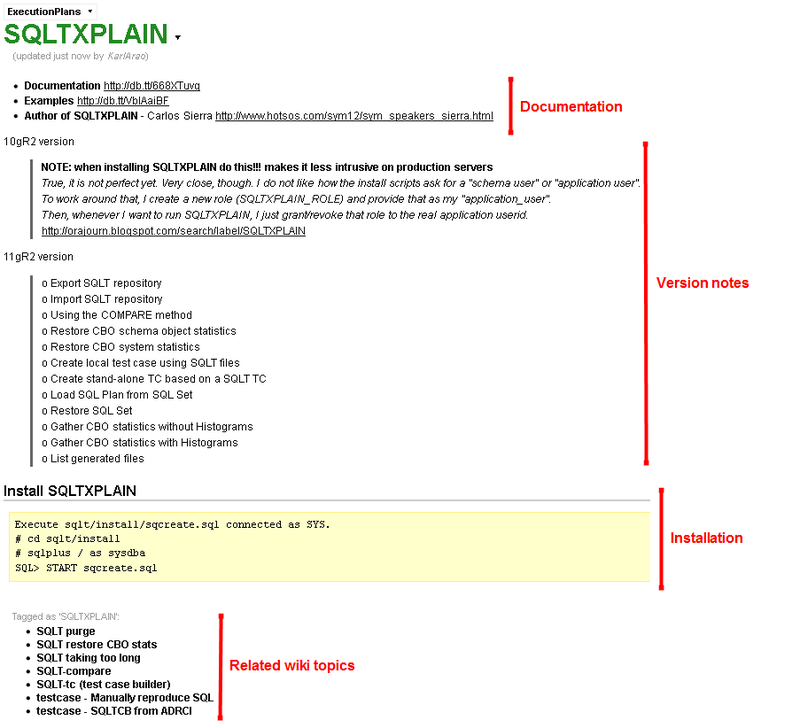 I’ve been using SQLTXPLAIN for quite a while, and I can say I’m a really big fan. It’s a cool tool to use for systematic SQL Tuning so I got them all neatly documented here http://karlarao.tiddlyspot.com/#SQLTXPLAIN. and support for RAC infrastructure, so you can spot the hungriest UNDO eaters for any given instance. NoCOUG Journal – Ask the Oracle ACEs – Why is my database slow? Dave Abercrombie mailed me earlier that the May 2011 NoCOUG Journal is already out and can be viewed online at http://www.nocoug.org/Journal/NoCOUG_Journal_201105.pdf. For all that loves Oracle performance.. Hotsos is truly the best conference, all the speakers are performance geeks, all the attendees talks about performance. Everything is about performance! There are lot more stuff that I like about my first Hotsos experience, the following are some of them.. I like that presenters and attendees are curious about what each performance geek has to say.. I like that whenever their brains are already fried. They consume as much coffee/soda as they can.. and just lay their butts on this couch.. and still.. talk about performance. It can’t even boot to BIOS, certainly a case worse than BSOD. So after fiddling with the laptop and systematically ruling out other component failures (power cable,monitor,memory,HD), Yes it’s much like troubleshooting an Oracle database! … we decided to bring it to the service center. There are so many things to blog about these past few days. That is mainly about the cool stuffs around OCW and OOW, sessions that I have attended (OCW, unconference, OOW), plus the interesting people that I’ve met on various areas of expertise.. So I’ll be posting some highlights (and a lot of photos) on the next posts.